Kappabashi (合羽橋) is the shopping district where dedicated for kitchen supplies and restaurant items near by Asakusa. Not only Japanese kitchen supply but also all supplies for any country foods. There are over 170 stores and you can buy any kinds of supplies. Because they have even special order supplies which use for only specified cooking method, people form all over the world visit Kapptabashi to get those supplies. All price are very reasonable, too. Visit on weekday. On the weekend, many stores will be closed. Kappabashi originally begins about 200 years ago by Kihachi Kappaya(合羽屋喜八) who spends his own money to build the Shinhorikawa River embankment. There is myth that Kappa (folklore) help his construction during the night. The name Kappaya and Kappa (folklore) has no relationship. The shopping district starts in 1912. 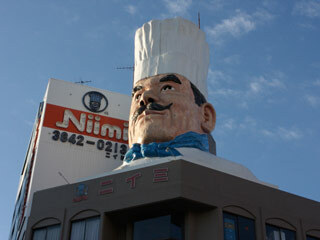 Now it is the biggest shopping district for Kitchen supply in Japan. You can buy all kinds of supplies. It is more like warehouse, but it is open for all people. Those price are very reasonable. One of the unique feature of this district is a food sample also known as fake food. The food sample is used for display of restaurant. Most of the samples are made by plastic or candle. In Kappabashi, those food sample are also sale as souvenir.